← Did group selection play a role in the evolution of plasmid endosymbiosis? Artem Kaznatcheev and I presented a poster on May 4th at the University of British Columbia to a highly interdisciplinary conference on religion. The conference acronym is CERC, which translates as Cultural Evolution of Religion Research Consortium. Most of the 60-some attendees are religion scholars and social scientists from North American and European universities. Many are also participants in a large partnership grant from the Social Sciences and Humanities Research Council of Canada (SSHRC), spearheaded by Ted Slingerland, an East Asian scholar at UBC. Some preliminary conversations with attendees indicated considerable apprehension about how researchers from the humanities and sciences would get on. Many of us are familiar with collaborative difficulties even in our own narrow domains. Skepticism was fairly common. As far as I know, our poster was the only computer simulation presented at the meeting. We titled it Agent-based modeling of the evolution of “religion”, with scare quotes around religion because of the superficial and off-hand way we treated it. Because we know from experience that simulations can be a tough sell even at a scientific psychology conference, we were curious about whether and how this poster would fly in this broader meeting. We opted for a poster composed almost entirely of graphics. This makes for convenient talking points and does not demand much reading, which is in any case anathema to social interaction and difficult to do in the noisy environment of a poster session. The major theme of this SSHRC grant is that humans might have evolved religion because religion enforces cooperation. Although I was late joiner of the SSHRC grant, our poster addressed two of the five major sub-questions posed in the grant application, from the standpoint of simulations of biological evolution: whether cooperation is inherently parochial, and whether cooperation is enhanced by existential insecurity. The left column of the A1-sized poster dealt with the parochial question, while the right column dealt with the insecurity question. The table on the left shows the net outcomes for player 1 in a well-known non-zero-sum game which highlights the essential dilemma of cooperation. Each of two players can either cooperate with the other or not. The payoff for the row player is computed as the benefit of receiving cooperation minus the cost of giving it. If player 1 cooperates with a cooperator, player 1 gets the benefit of receiving cooperation and loses the cost of giving it. 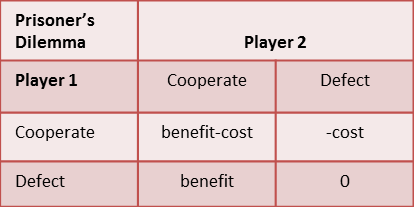 If player 1 cooperates against a defector, player 1 incurs the cost of giving cooperation but enjoys no benefit (the so-called sucker’s payoff). If player 1 defects against a cooperator, player 1 enjoys the benefit of cooperation without incurring any cost (the so-called temptation to defect). When defection is mutual, the outcome is 0, as no cooperation occurs. Without knowing what the other player will do, mutual defection is the rational solution (Nash equilibrium). However, as long as benefit exceeds cost, which it often does in specialized populations, the best overall outcome for both parties is mutual cooperation (Pareto optimum). Because of the competitive nature of natural selection, cooperation between biological agents has been a mystery since Darwin, and yet cooperation is extremely common across biology. One explanation is that species have somehow evolved to cooperate. 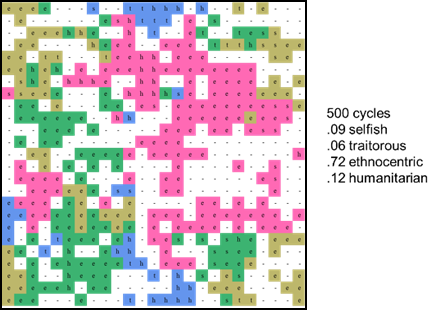 von Neumann neighbors by playing a one-shot prisoner’s dilemma game, with the game’s outcomes added to the agent’s potential to reproduce. An agent can reproduce if a randomly-drawn proportion is less than this modified potential, and if there is an empty adjacent space for the offspring. 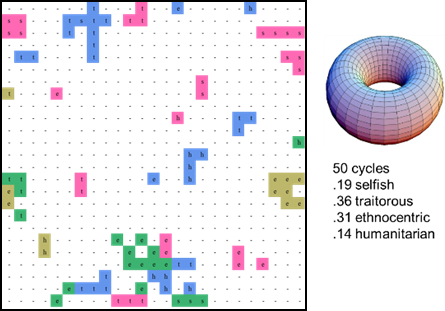 The world is a 50-by-50 toroidal (to ensure that each agent has the same number of potential neighbors) lattice, as illustrated in this sample figure after 50 evolutionary cycles. Each agent has three simple genes. Two genes specify cooperation or defection against in-group or out-group neighbors, and the third specifies a group tag so that an agent can identify whether their neighbor is from the same group. The world starts empty, and each evolutionary cycle a new, randomly-constructed agent immigrates into a randomly-chosen cell. Cloned offspring are just like their parent, except for a tiny mutation rate. At 50 cycles, the world is still relatively empty, but beginning correlations between strategy, tag, and location can already be detected. Group tag is indicated by color, and strategy by letter. Selfish agents don’t cooperate with anyone, traitors cooperate outside but not inside their group, ethnocentrics cooperate inside but not outside their group, and humanitarians cooperate with everyone. These sample plots are for a smaller 25×25 lattice so that the world’s state is easier to view. After 500 evolutionary cycles, this same world is much fuller, and exhibits ethnocentric dominance as seen on the left. Below right, a plot of strategy means and standard errors shows results for 50 worlds across 1000 cycles. 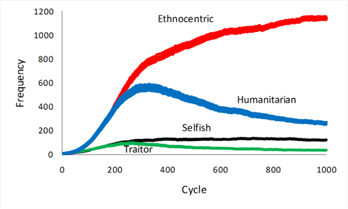 When the population saturates, around 200 cycles, ethnocentrics start to pull away from their close competitor, humanitarians. The reason for this separation is that humanitarians cooperate across group frontiers, incurring the sucker’s payoff, while ethnocentrics do not, a benefit of succumbing to the temptation to defect. 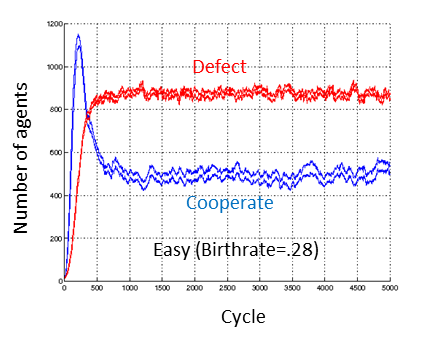 Ethnocentric dominance is robust across wide variation in parameter settings, as long as the temptation to defect exceeds the cost of cooperation. Selfish and traitorous strategies never get much traction because they don’t take care of their own kind. Due to mutations, these free-rider strategies do not disappear (Hartshorn, Kaznatcheev, & Shultz, in press). It is also interesting to note that ethnocentric cooperation is common across a wide range of species, from bacteria and plants to people (witness voting patterns and ethnic cleansing). So, yes, cooperation does tend to be parochial, at least with viscous populations and group tags, and when group detection is not too costly (Kaznatcheev, 2010a, 2010b; Kaznatcheev & Shultz, 2011). Evolution favors ethnocentrism because it keeps cooperation high (here around 75% of interactions), sometimes even higher than humanitarianism does. We implemented existential insecurity by varying the austerity of the environment. In simulations, an austere environment can be created by either increasing death rate or decreasing birthrate. 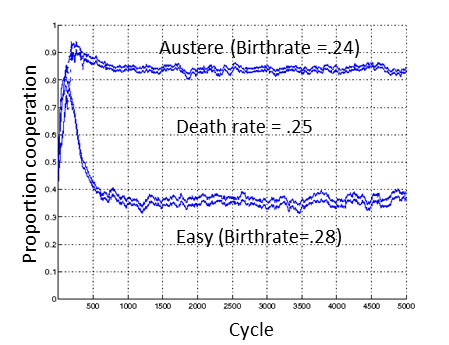 We varied birthrate, while holding death rate constant. This preliminary experiment was done similarly to the parochial simulation except for the absence of group tags, to keep things simple. The only two strategies here are cooperation or defection. This figure on left shows standard errors of mean proportions of cooperation. 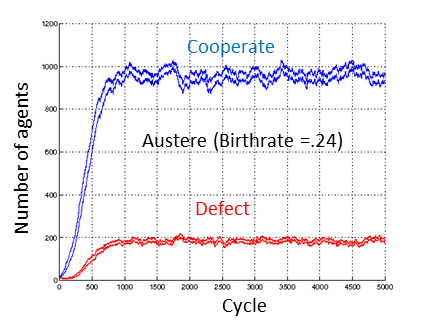 There are more cooperative behaviors in austere than in easy worlds. Below left, standard error values around the mean number of strategies in an austere environment reveal more cooperative strategies than defection strategies. Below right, the opposite is true for an easy environment. So, in this very abstract study, austerity favors the evolution of cooperation. We do still need to explore the parametric space of this simulation and run it with group tags. they were unfamiliar with the methodology, they readily recognized the implications for religion, and they found it very interesting. Some even liked our deliberately evocative names for cooperation strategies. Most of the time, I inadvertently (or sometimes intentionally) neglected to mention that different religions could be represented by group tags. To my initial surprise, our poster goers did not need to hear me say that – they automatically inferred it. None objected to our superficial characterization of religion. Perhaps this connection is already evident from the many religion-fueled conflicts around the world, currently and throughout human history. Of course, our simulations are considerably more general than religious tags. Unlike other species with relatively fixed group tags, humans have proven to be quite flexible in the tags they use to discriminate in- from out-group members. Humans use skin color, language, language accent (Cohen, 2012), location, and many other initially arbitrary tags to determine what sort of agent they are dealing with. In many urban centers around the world, it is important not to wear the wrong-color shirt in a particular neighborhood. Such tags are cultural products, but the important point is that humans are genetically prepared to use group tags in support of their ethnocentric patterns of cooperation. other simulations from our lab and this blog. To cite a single example, Professor Lyle Eslinger, a particularly astute religious-studies colleague from U. of Calgary noted that our austerity simulation reminded him of the pioneering (1902) observations of Prince Kropotkin in the austere regions of Siberia. Cooperation was more evident to Kropotkin than the competition noted by Darwin in the easier Galápagos Islands. Not many computational modelers would have spontaneously come up with that reference. Binghamton, who gave a conference talk on their study of church-goers in that city. The gist of these correlational studies is that religious activity is positively related to austere environmental conditions (Delamontagne, 2010; Gill & Lundsgaarde, 2004; Immerzeel & van Tubergen, 2013; Ruiter & van Tubergen, 2009). In a complementary fashion, our abstract simulation shows that increased austerity causes an increase in cooperation and cooperative strategies; perhaps additional simulations will provide further insights and qualifications. It turns out that we humans and these abstract computer agents are not alone in exhibiting a positive relation between environmental austerity and cooperation. This figure shows that yeast populations with pure cooperators are better able to survive a sudden and harsh environmental change than are mixed populations of cooperators and defectors. All six pure-cooperator populations and only one of six mixed populations were able to withstand a sudden drop in the food supply on day 3 (Sanchez & Gore, 2013). Notwithstanding all this harmony, I do anticipate some downstream controversy around the notion of group selection as an evolutionary mechanism. It is relevant to note that the effects in our simulations are products of simulated individual selection. Our groups are emergent properties of natural selection acting on the reproductive potentials of individual agents. Notions of group selection are not necessary to explain our simulation results. Cohen, E. (2012). The evolution of tag-based cooperation in humans: the case for accent. Current Anthropology, 53, 588-616. Delamontagne, R. G. (2010). High religiosity and societal dysfunction in the United States during the first decade of the twenty-first century. Evolutionary Psychology, 8(4), 617-657. Gill, A., & Lundsgaarde, E. (2004). State welfare spending and religiosity: a cross-national analysis. and Society, 16(4), 399-436. Hartshorn, M., Kaznatcheev, A., & Shultz, T. R. (in press). The evolutionary dominance of ethnocentric cooperation. Journal of Artificial Societies and Social Simulation. Immerzeel, T., & van Tubergen, F. (2013). Religion as reassurance? Testing the insecurity theory in 26 European countries. European Sociological Review, 29(2), 359-372. Sanchez, A., & Gore, J. (2013). Feedback between population and evolutionary dynamics determines the fate of social microbial populations. PLoS Biology, 11(4), e1001547. Pingback: Aroga - The evolution of ‘Collectives’: Need of the hour?